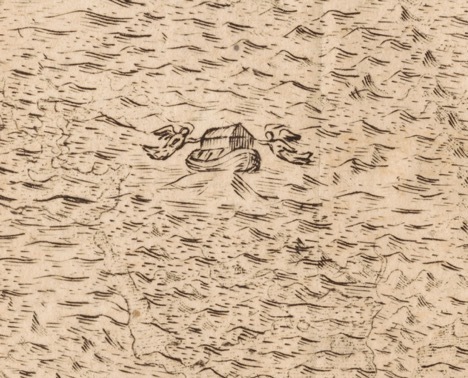 Our exhibit begins with the 1697 English edition of Thomas Burnet’s Theory of the Earth, opened to an engraved image of a view of the Earth at the receding of the waters of the great Deluge described in Genesis 6-9, showing a tiny Noah’s Ark grounded on Mount Ararat at the center, and, according to the author’s theory, Earth’s newly formed continents and mountain chains just visible under the waves. As an example of illustration we would consider the image today to be more fanciful than scientific, based on scriptural sources, since we believe today that most familiar landforms developed through time very gradually and not by catastrophes and cataclysms, divinely caused or natural, such as floods and volcanoes. 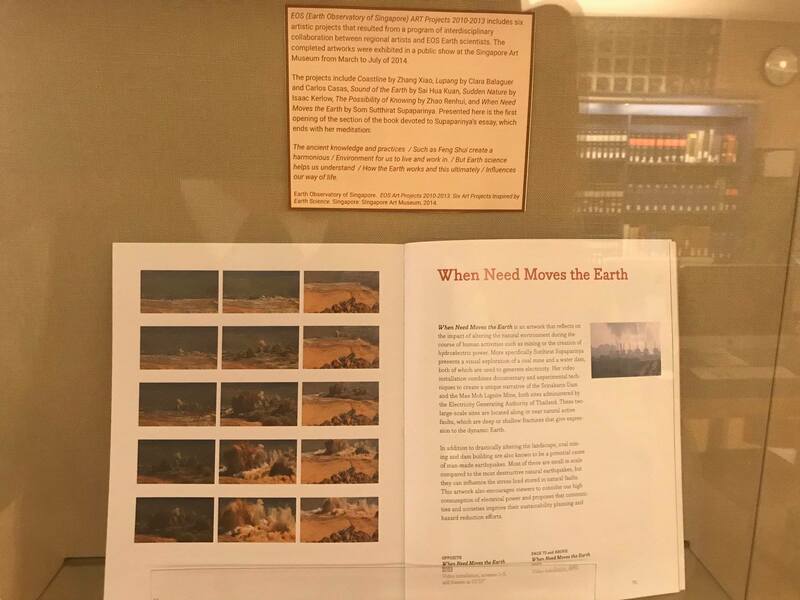 The image, however, is emblematic of a number of natural histories illustrated by contemporary interpreters of the science and history of our planet, including the artists whose works appear elsewhere in this exhibit. 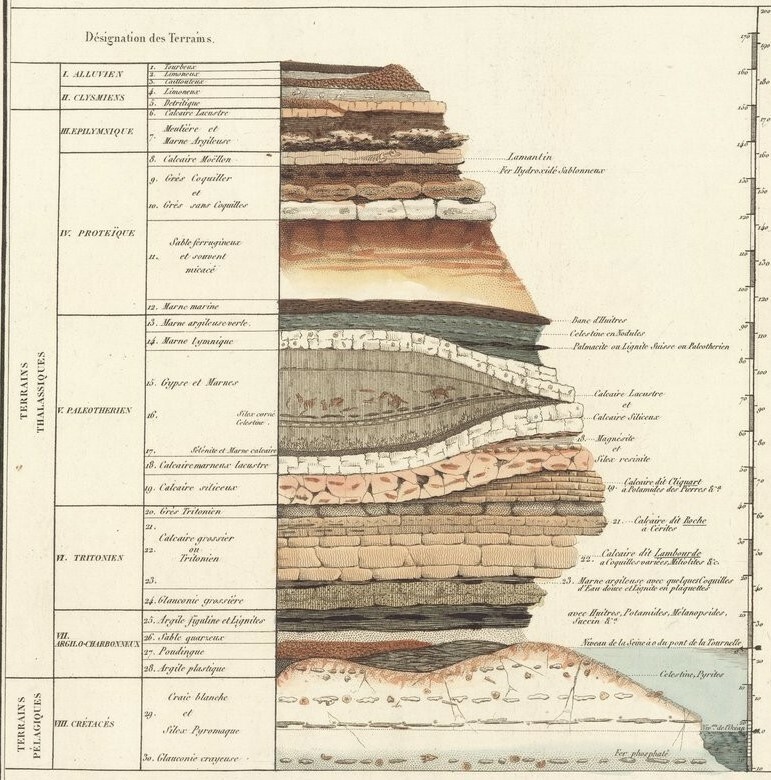 Detail of an illustration concerning the composition of the crust in the Paris’ basin, from Cuvier’s and Brongniart’s study. Noah’s Ark, whose etymology (Old English ærc, from Latin arca, chest) describes a closed box or tabernacle (as in the Ark of the Covenant), denotes as well a box for keeping records. 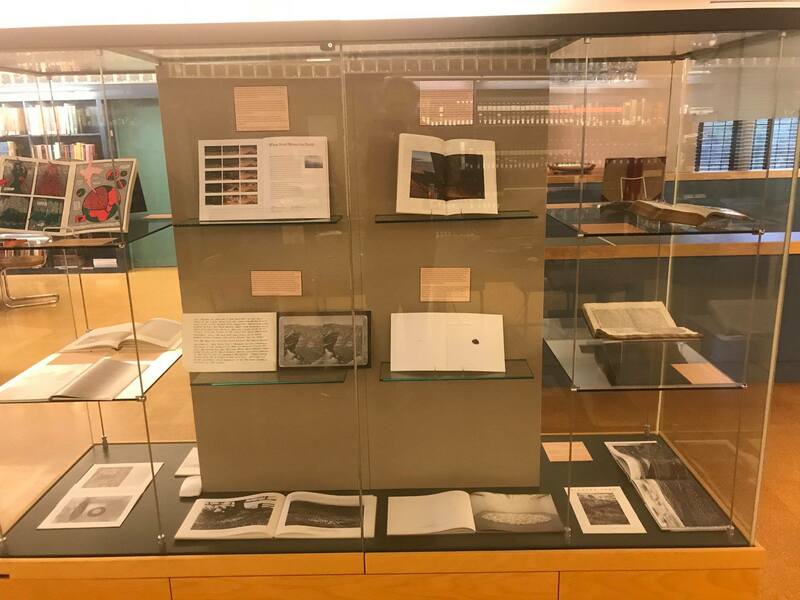 It is related to our word “archive,” and is symbolic of the impulse toward archivism that characterizes so many of the books displayed here. George Cuvier, the founder of paleontology, for instance, in his own Theory of the Earth (1818) presents the Earth itself as an archive of ancient activity as well as of living and extinct life forms, organized temporally in layered strata, which binds geologic science through the fossil record to biological history. The ark of the Earth itself therefore transports and discloses to us across great spans of time information about events and species that time and the Earth have both swallowed up, including, as Darwin would eventually surmise, our own ancestry. 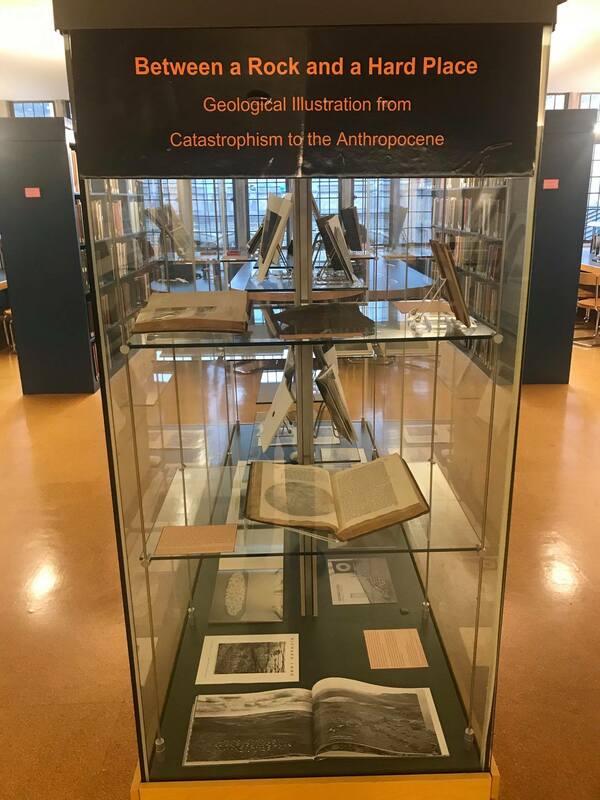 The close alliance between artistic illustration and geologic theory and documentation examined in the Frances Lehman Loeb Art Center exhibition Past Time: Geology in European and American Art, which this exhibit accompanies, was facilitated from the middle of the Nineteenth Century, as was all scientific recording, with the invention of photography and the adoption of the photographic document. 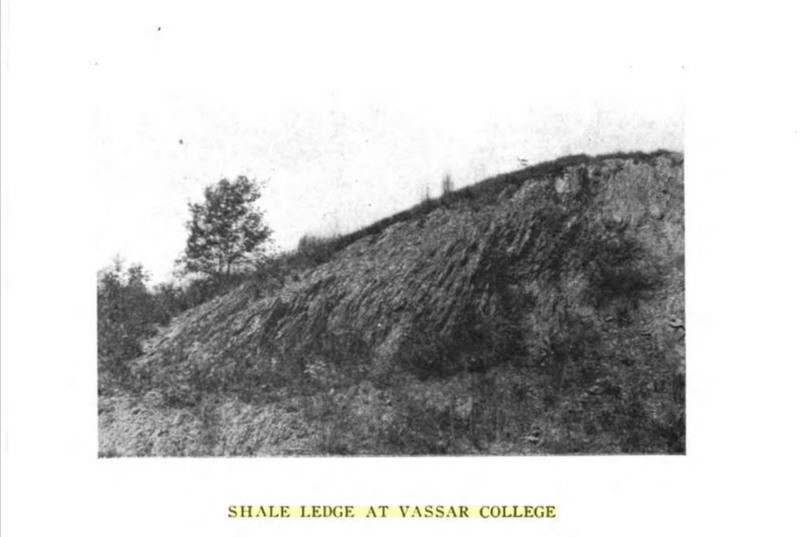 George Shattuck, a Professor of Geology and Mineralogy at Vassar College at the beginning of the Twentieth Century, bolstered his own geologic exploration and teaching by becoming an early adept and proponent of this medium, deployed here for educational purposes in his photographic guide, Geological Rambles Near Vassar College, (1907). 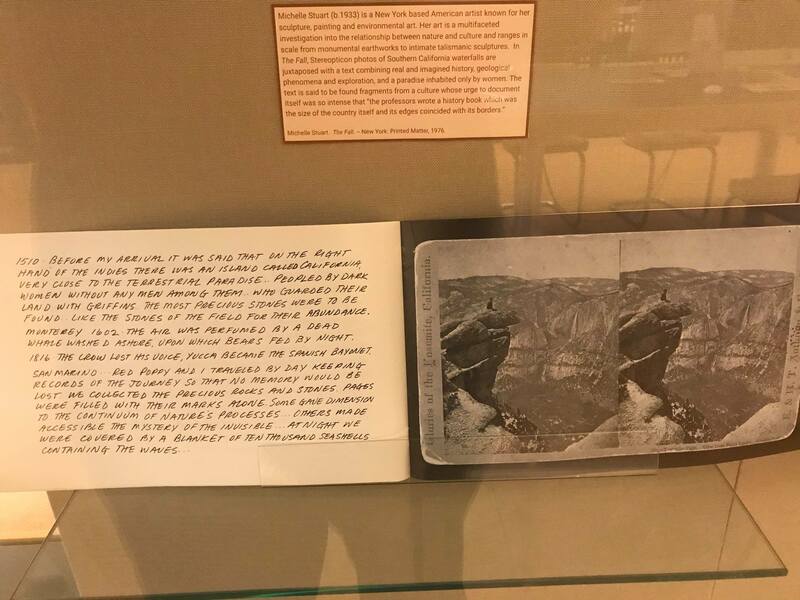 Besides his use of photography as an archival medium, Shattuck’s descriptive rambles signal another feature embodied in Burnet’s account of Noah’s Ark, that of the “story” in “natural history,” or the use of narrative for recording past events. 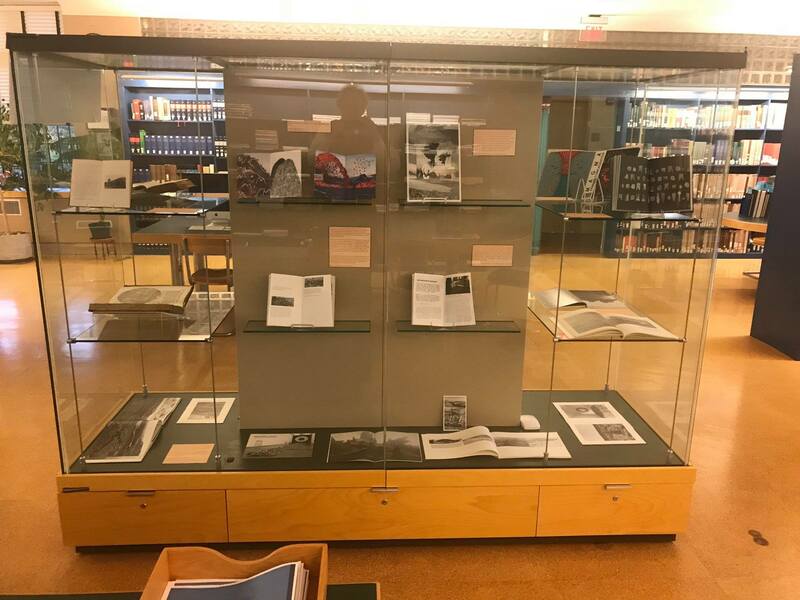 Most of the remaining artists’ books in our own “ark” (our Art Library exhibit case was originally designed for displaying scientific specimens) investigate both types of documentary media: storytelling and the photograph. 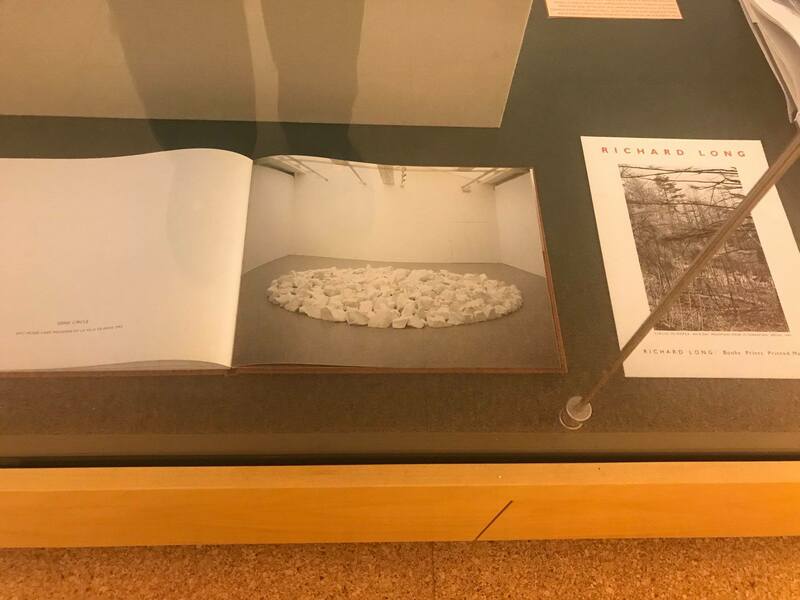 Most prominent here for examples of itinerant narrative and photography both are the publications of the British artist Richard Long, whose work is comprised of photographic and sculptural records of his own rambles across landscapes and his interventions therein. 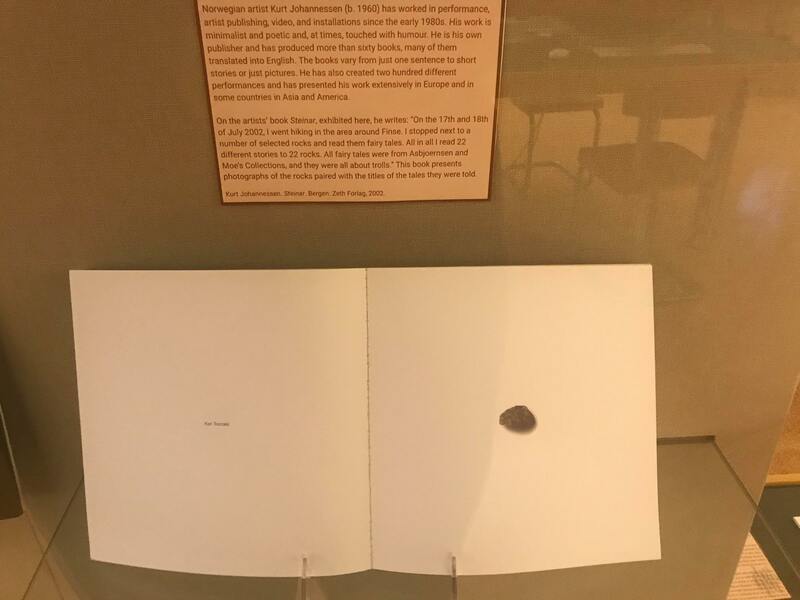 Eight of his books are exhibited here along the bottom of the exhibit case (1984-2001). 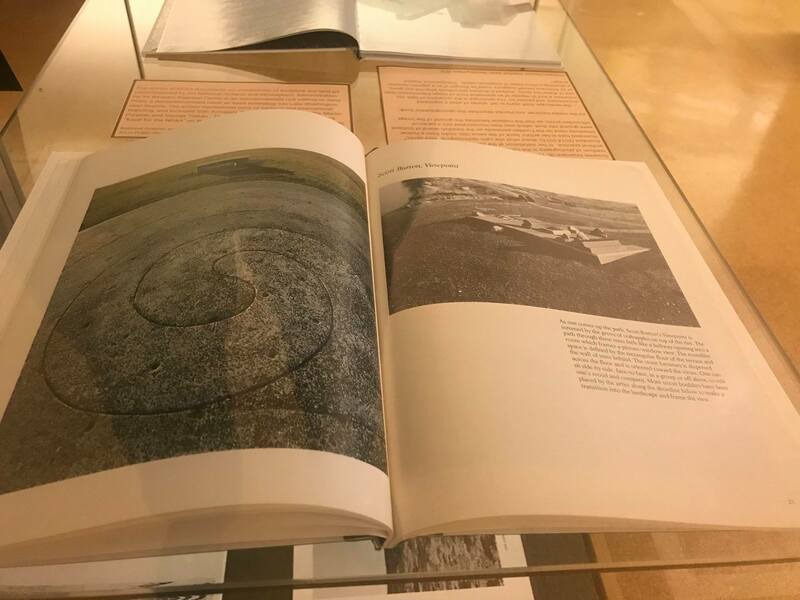 Long is keenly interested in the role of human activity on the memorial record of the Earth, and he may be viewed as an early interpreter of the concept of a new era characterized by human impact on the Earth’s geology and ecosystems, designated popularly as the Anthropocene. and the Norwegian artist Kurt Johannessen’s talismanic and anthropomorphizing Steiner (2002), who recites stories not about rocks but to rocks. 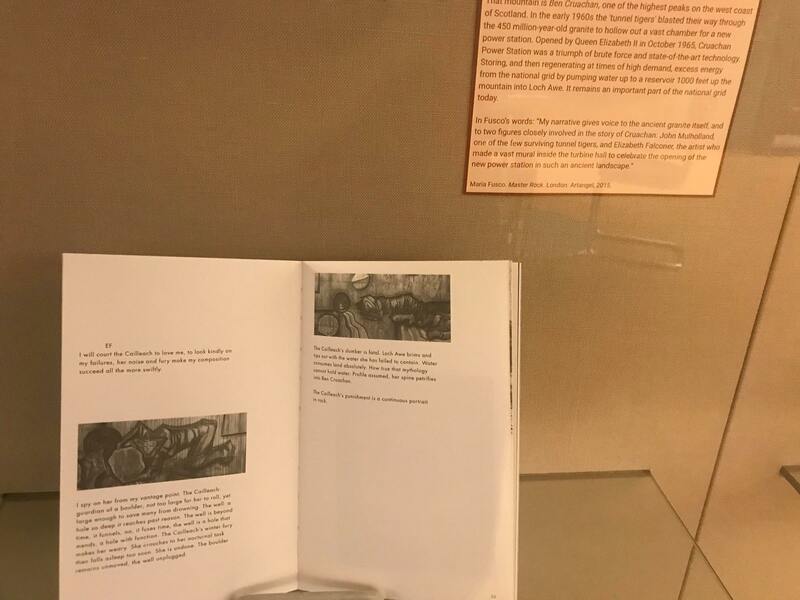 Like Johannessen’s Steiner, Luke Stettner’s artist’s book History Database (2016) is an archive that blurs the distinction between the living or once-living, and non-living aspects of the geologic record. 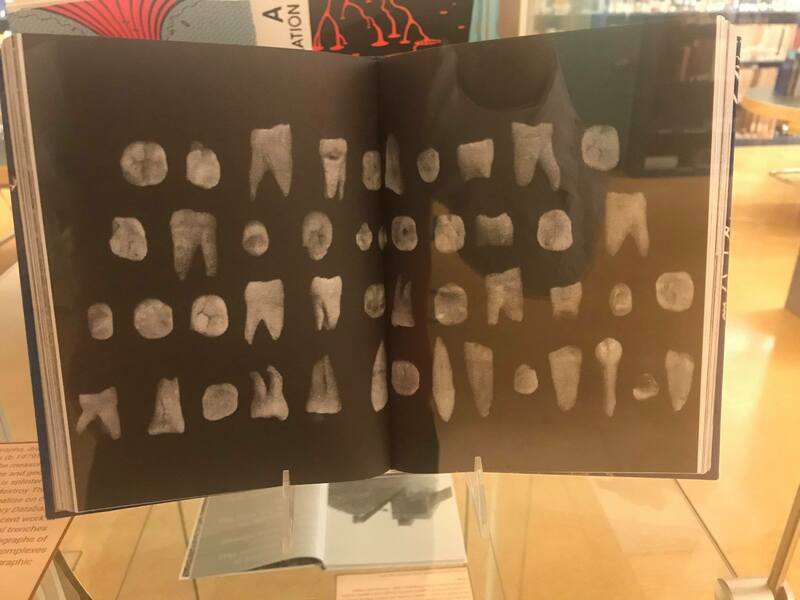 Like Martinovic, Fusco, and Stuart, Stettner employs archival photographs and illustrations, along with new photography, drawings, pictograms and photocopies to tell a larger story about mortality, documentation, and deep time. 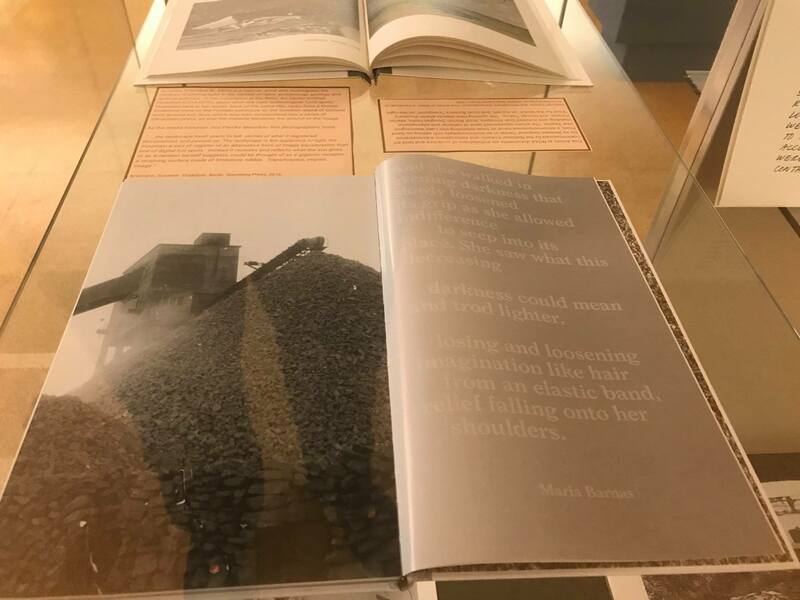 Most interesting in her exploration of the Earth, archives, narrative, and photography, in her work Duskdust (2016), the Berlin-born artist Susanne Kriemann creates documents from the material of the Earth itself in the stark light of what is sometimes referred to as the “bunker archaeology” of the Anthropocene. Her silk screens incorporate paper made from ground limestone from the abandoned quarry on the Swedish island of Gotland she investigates, while her photographs capture the natural light of the quarry at various times of day, relating these by association to narrative texts and archival materials, including old photographs. Not all of our contemporary illustrative interpreters of the Earth are photographers. 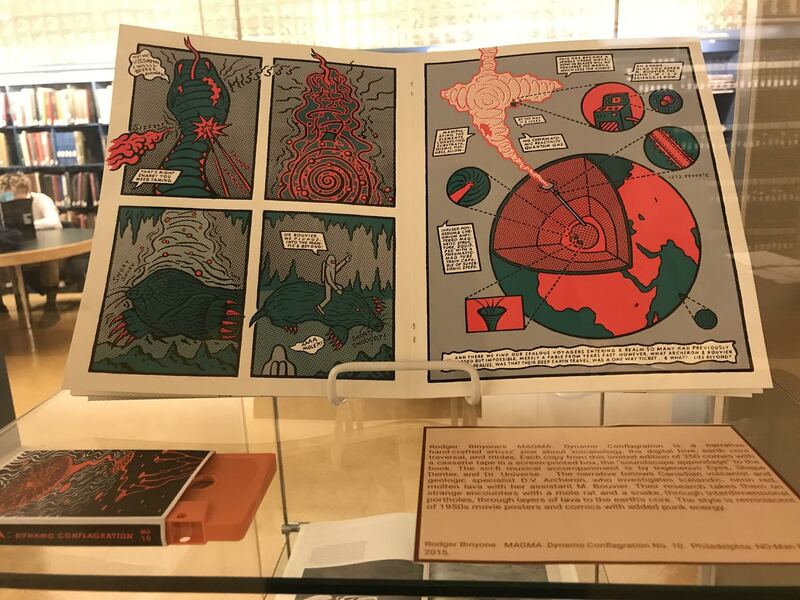 The graphic (from the Greek graphos, to write, carve, or dig) artist Rodger Binyone’s colorful artist’s book MAGMA: Dynamo Conflagration No. 10 (2015), is a fanciful narrative based loosely on Jules Verne’s Journey to the Center of the Earth (very loosely), about a Canadian volcanist and her assistant’s quest, aided by a mole rat, into the Earth’s core in search of a special neon-red Icelandic magma. Brooklyn-based Sibba Hartunian’s books Volcanoes and Mountains are colorful multiples issued and sold inexpensively in small numbers, produced through environmentally-friendly risograph printing (employing a soy-based gelatin), enlisting the artist’s process in limiting the disruption done to the Earth by human intervention. 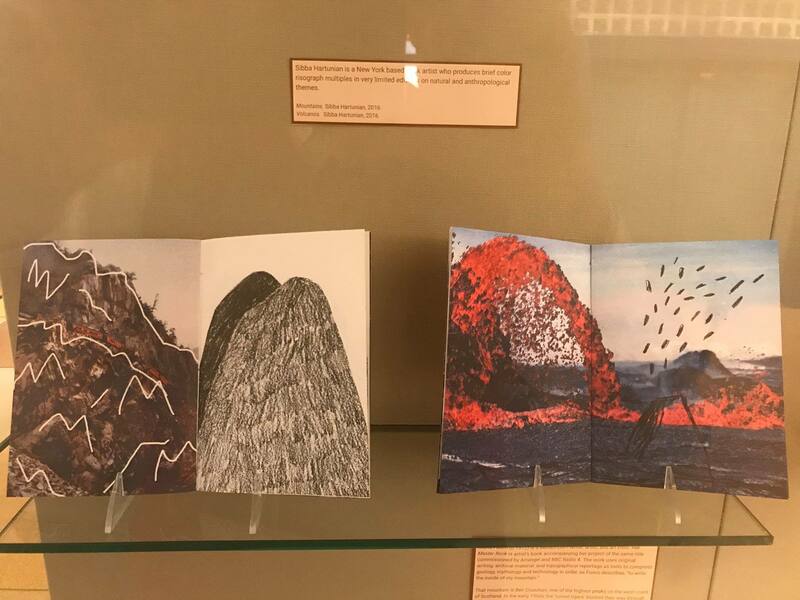 and EOS (Earth Observatory Singapore: Art Projects 2010-2013: Six Projects Inspired by Earth Science (2014). 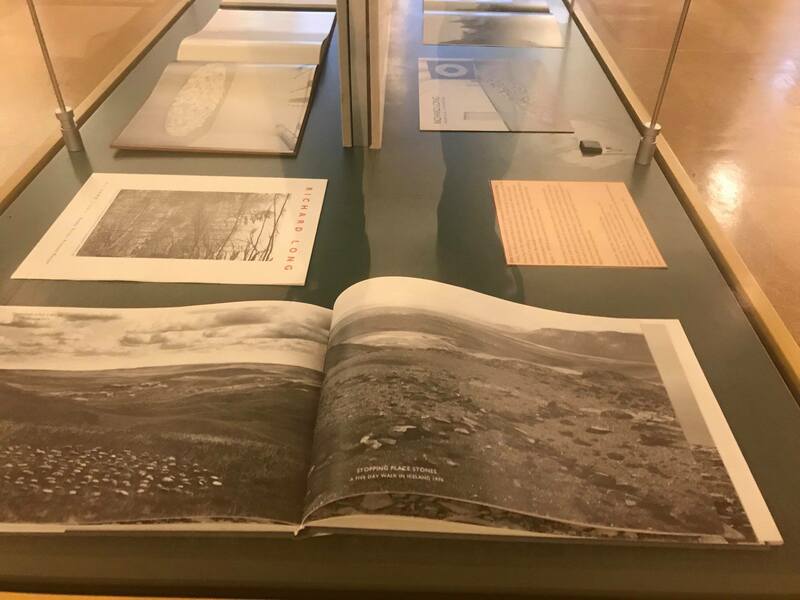 Finally, in her acclaimed Queens Museum exhibition of last year, Wandering Lake (2017), documented in her artist book of the same name, Patty Chang offers a geologic, archival, and photographic meditation on the loss of her father and the birth of her son. Her thoughts are interwoven with a narrative inspired by the Swedish geographer and travel writer Sven Hedin, who tells a story about a migrating lake in the Gobi desert. 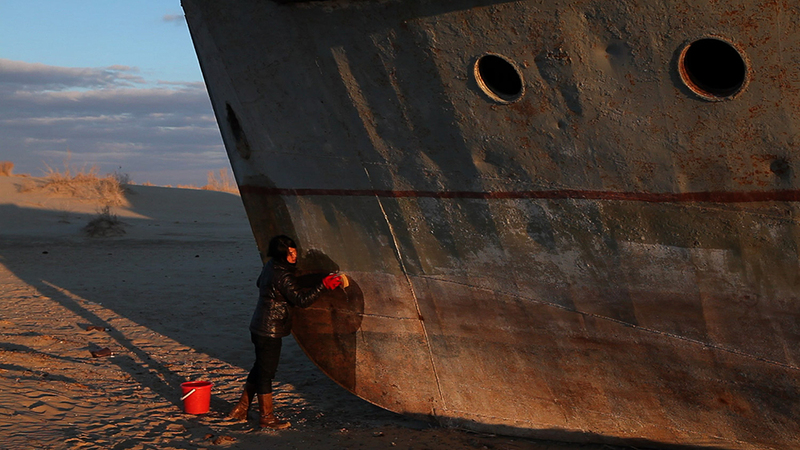 A story of powerlessness, Chang’s statement has more to do with the function of art as a vehicle for mourning the present than its imagined role in making things better in the future. 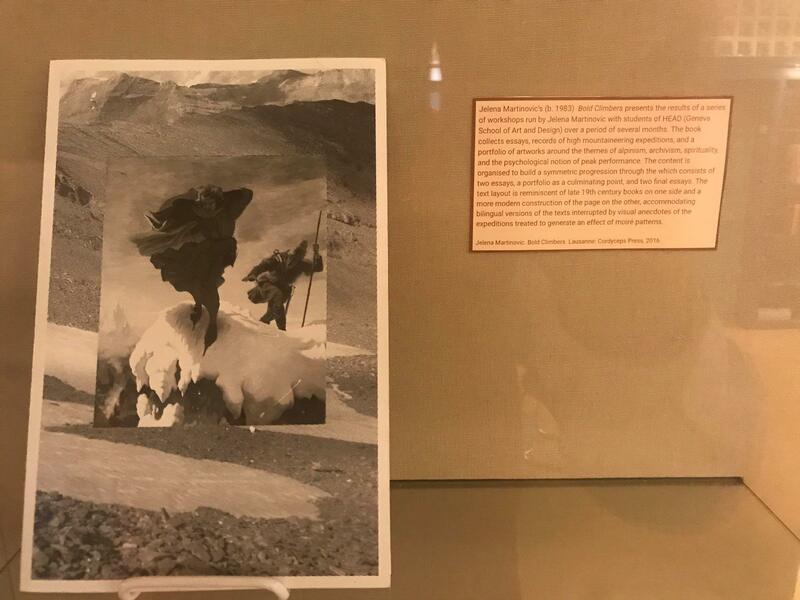 As a counterpart to the image we opened with of Noah’s Ark grounded upon the rock of Mount Ararat, the exhibit ends with the hard place of an emblematic photograph by Chang of another beached boat as she hopelessly scrubs its barnacled hull. Burnett, Thomas. The Theory of the Earth: containing an account of the original of the Earth, and of all the general changes which it hath already undergone or is to undergo till the Consummation of all things. Third Edition. – London: R.N., 1697. 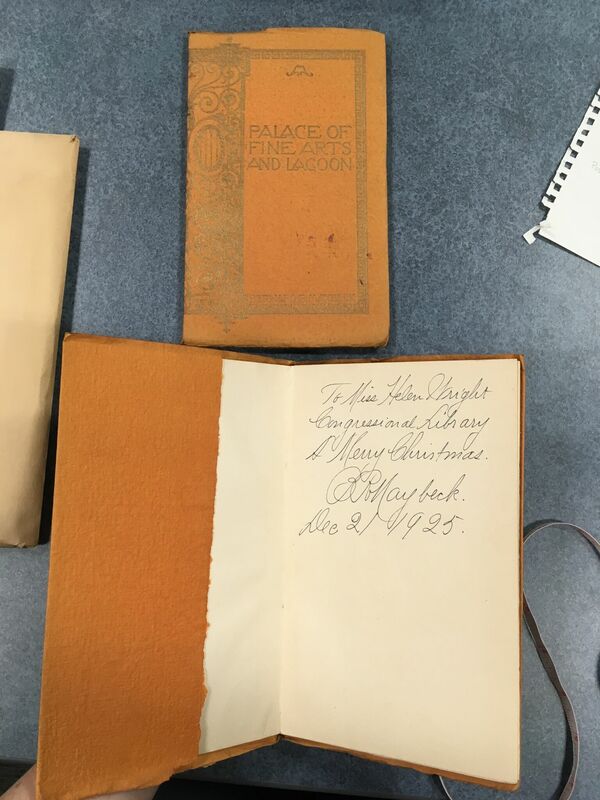 Loaned from the collection of Prof. Jill Schneiderman. Cuvier, Jean Leopold Nicholas Frederick Cuvier, Baron. 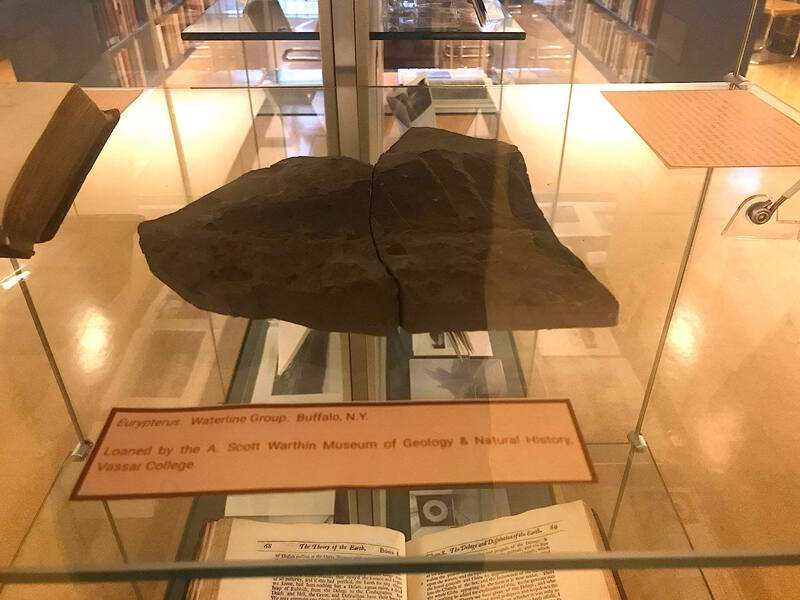 Essay on the Theory of the Earth with Mineralogical Notes and an Account of Cuvier’s Geological Discoveries by Professor Jameson, to added Observations on the Geology of North America. Illustrated by Samuel L. Mitchell. – New York: Kirk & Mercein, 1818. 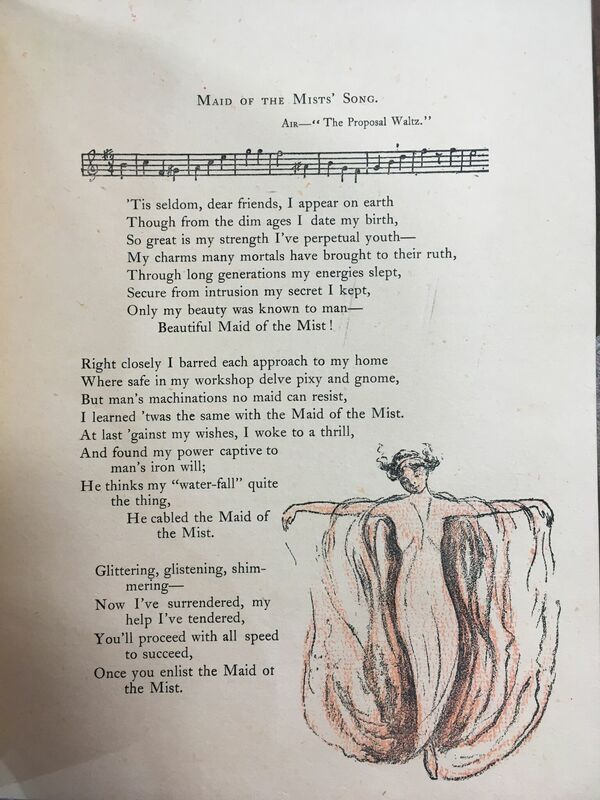 Loaned from the collection of Prof. Jill Schneiderman. Shattuck, GeorgeBurbank. Geological Rambles Near Vassar College. -Poughkeepsie: The Vassar College Press, 1907. 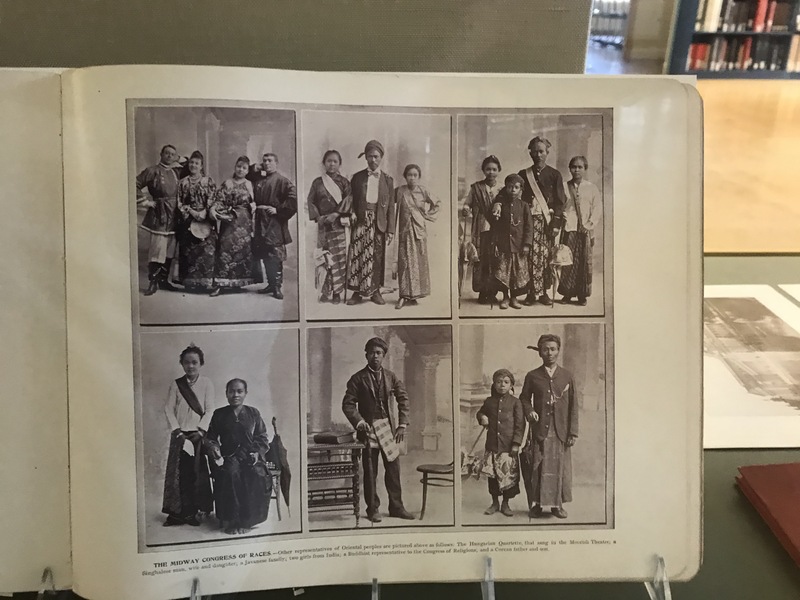 Loaned from the collection of Prof. Jill Schneiderman. Stuart, Michelle. The Fall. 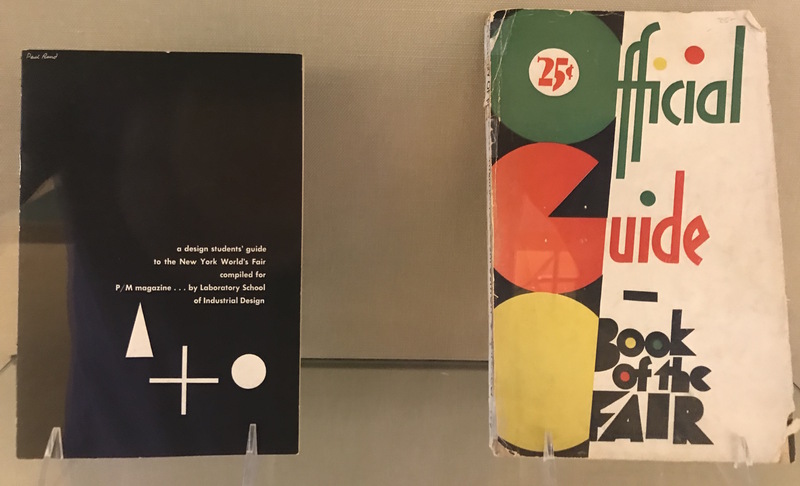 – New York: Printed Matter, 1976. Long, Richard. Aggie Weston’s. No. 16. – London: Coracle Press, 1979. Long, Richard. Richard Long. – Eindhoven: Van Abbemuseum Eindhoven, 1979. Long, Richard. 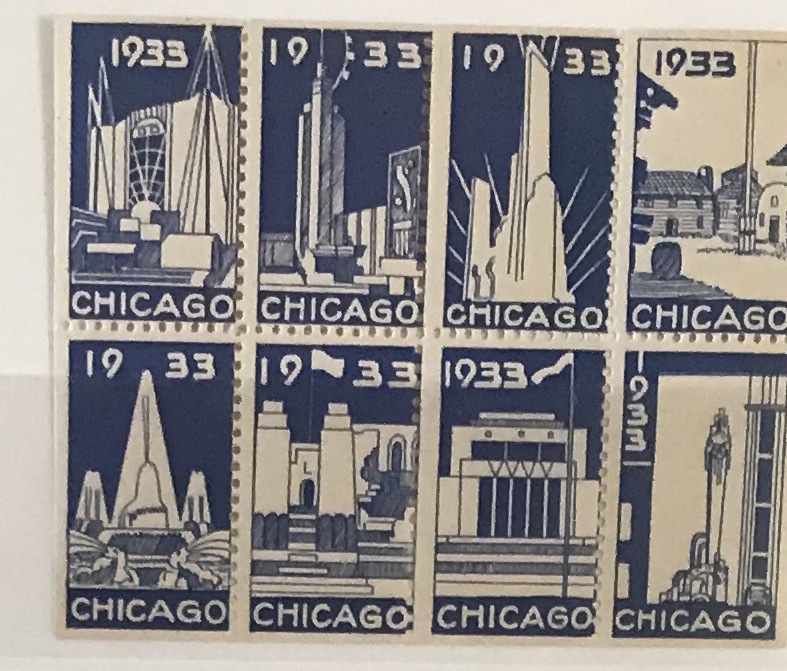 Postcards 1968-1982. — Paris: Union à Paris, 1984. Long, Richard. Richard Long. – Fonds Regional d’Art Contemporain Aquitaine, 1985. United States. National Oceanic and Atmospheric Administration. Five Artists at NOAA: A Casebook on Art in Public Places.— Seattle: Real Comet Press, 1985. Long, Richard. Neanderthal Line, White Water Circle. — Dusseldorf: Kunstsammlung Nordrhein-Westfalen, 1994. Long, Richard. Richard Long. — Dusseldorf: Kunstsammlung Nordrhein-Westfalen, 1994. Long, Richard. Mountains and Waters. – New York: Braziller, 2001. Johannessen, Kurt. Steinar. — Bergen: Zeth Forlag, 2002. Turpin, Etienne. 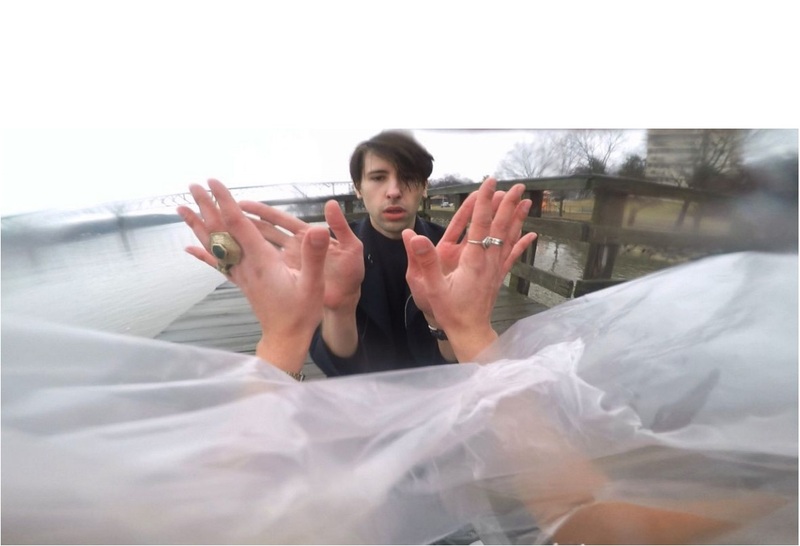 An Anarchist Introduction to the Anthropocene. – Brooklyn: Etienne Turpin, 2013. EOS Earth Observatory Singapore. 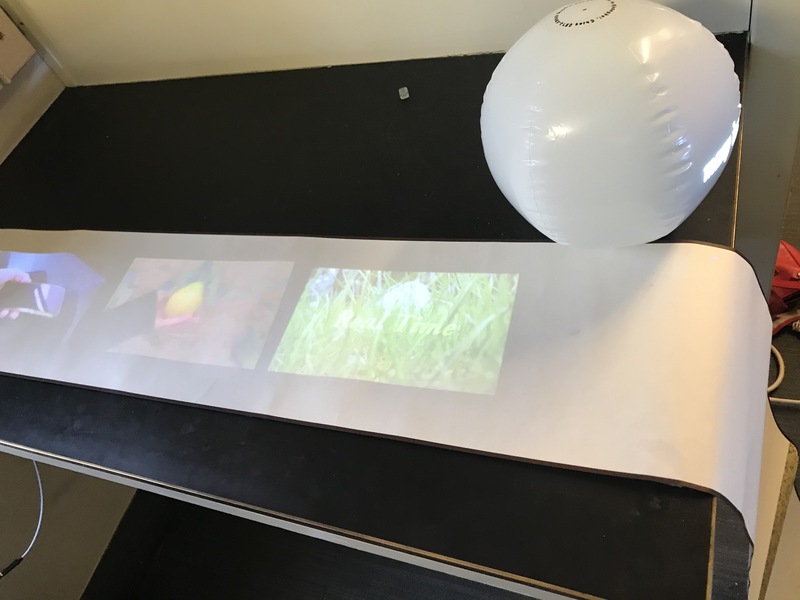 ART Projects 2010-2013: Six Art Projects Inspired by Earth Science. — Singapore: Singapore Art Museum, 2014. Binyone, Rodger. MAGMA: Dynamo Conflagration No. 10. – Philadelphia, 2015. Fusco, Maria. Master Rock. – London: Artangel, 2015. Hartunian, Sibba. Mountains. – Sibba Hartunian, 2016. Hartunian, Sibba. Volcanoes. – Sibba Hartunian, 2016. Kriemann, Susanne. Duskdust. – Berling: Sternberg Press, 2016. Martinovic, Jelena. Bold Climbers. – Lausanne: Cordyceps Press, 2016. Stettner, Luke. History Database. – SPBH Editions, 2016. Chang, Patty. Wandering Lake. – New York: Queens Museum, 2017. Sofía Benitez. 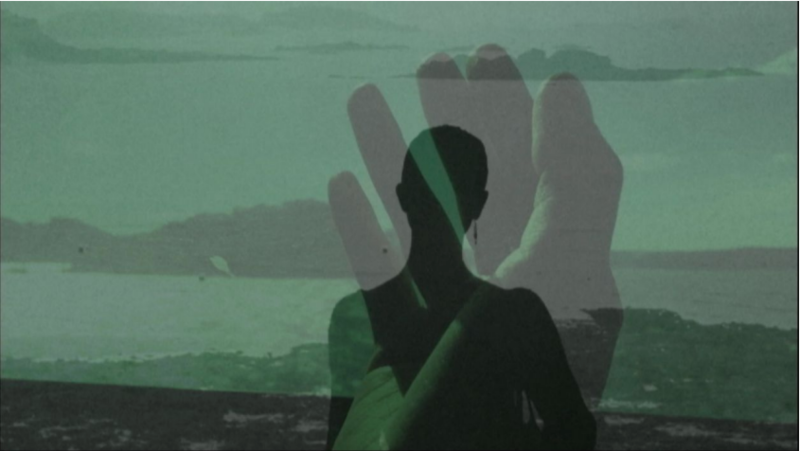 Still from the video “Stand By Me”. 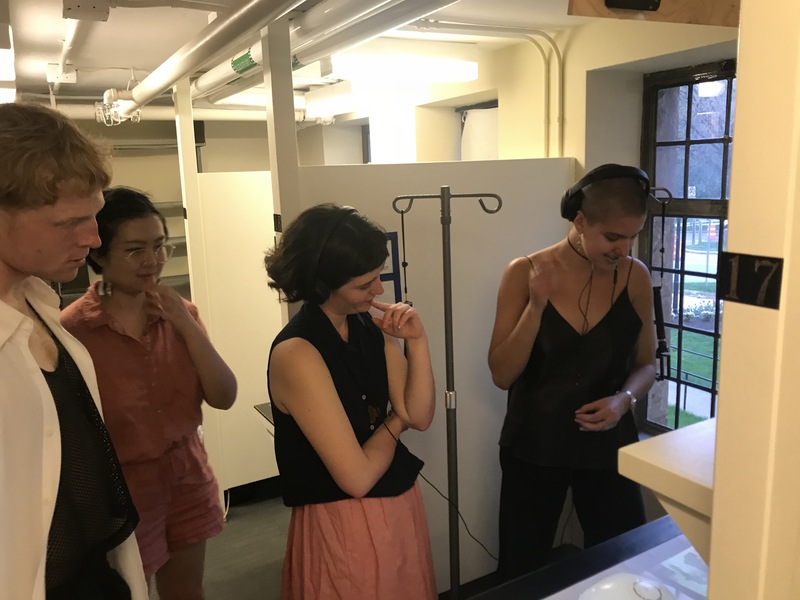 On the evening of May 4, 2018 a group of five graduating seniors under the advisorships of Professors Heesok Chang and Molly Nesbit in Vassar’s Media Studies Program presented multimedia installations as part of their theses requirements in Van Ingen Hall: in the Art Library Stacks and the former Visual Resources Library. Projects were presented by Sophia Benitez, Delphine Douglas, Lena Redford, Joseph Simon and Sixing Xu. 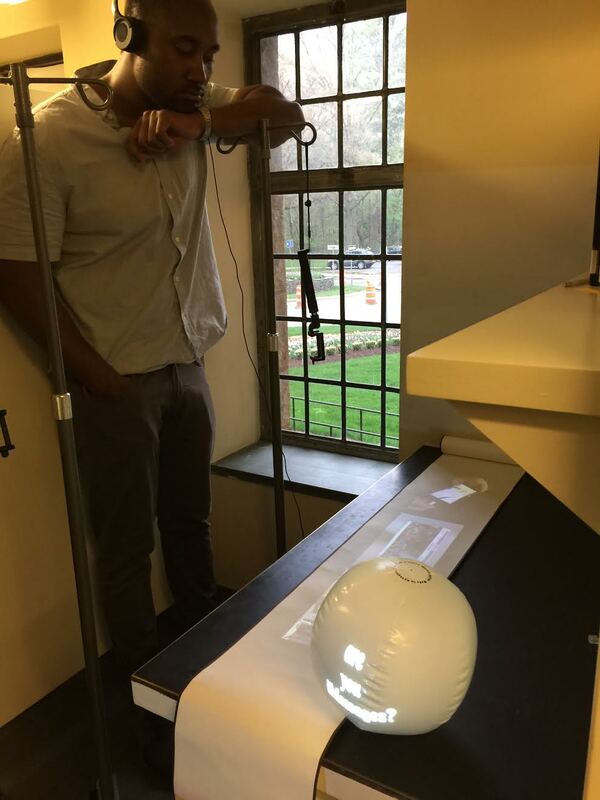 These multimedia micro-utopias variously consisted of sounds, still and moving projections onto flat surfaces and objects, screen images, and texts, intentionally contextualized by the physical spaces in which they were exhibited such as the Art Library study carrels. 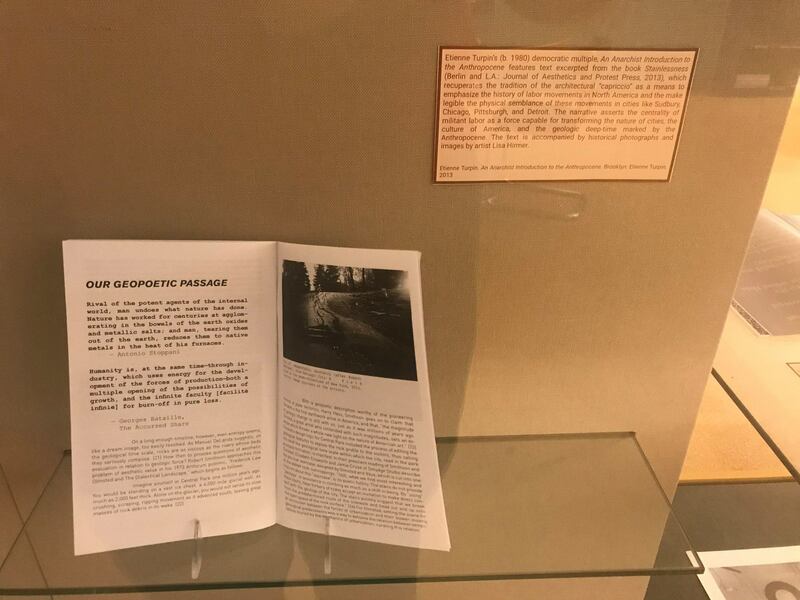 Visitors were presented with a map locating each installation, and the presenters were available at their installations for comments and questions. 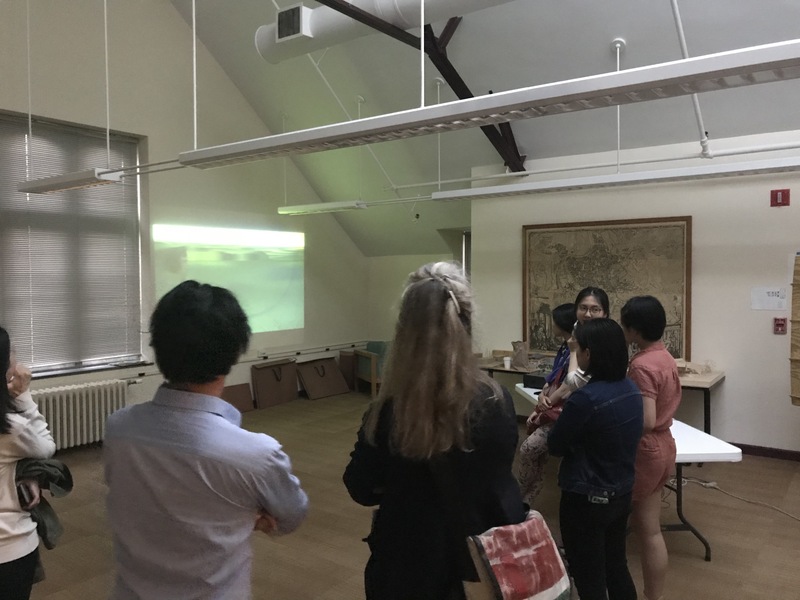 A lively audience consisted of curious students, faculty, and people who had come to campus especially to see the exhibition/happening. 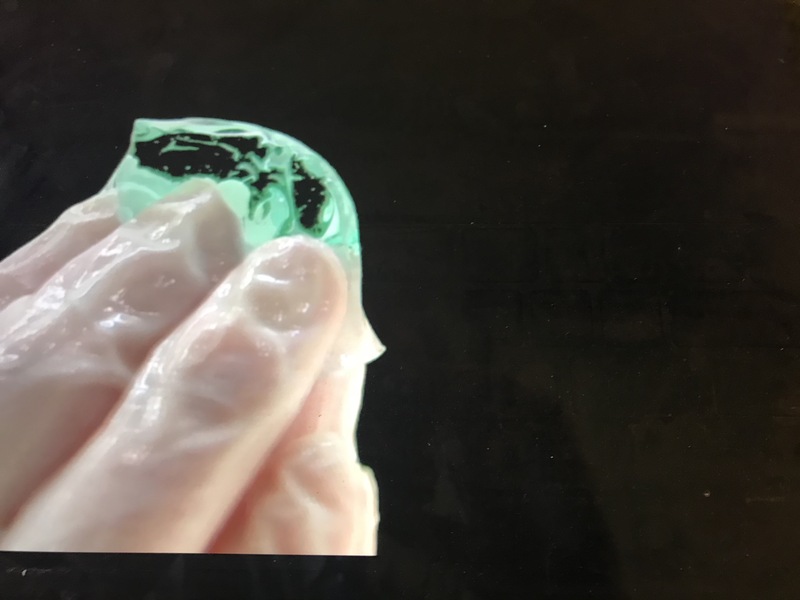 The projects were co-investigative: where media were deployed as self-interrogating research-objects to examine concepts of subjectivity and interactivity in a fluid universe shaped by digital experiences. 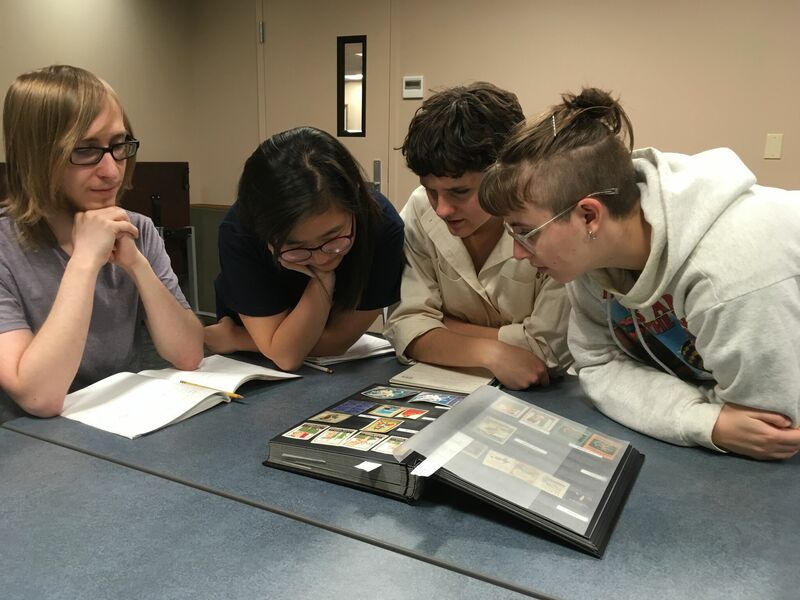 Collective areas of inquiry included the impact of the digital image on art and life, time and history, friendship and relationships, embodiment and gender, space and boundaries. Drawing energy from their surroundings, the projects were activated by the space of the library, and in turn activated the library space in a charged circuit of meaningful, self-reflective, and creative harmonies, resonating with one another in a collective effort where the the library was shown to offer new and progressive possibilities of embodiment and habitation. 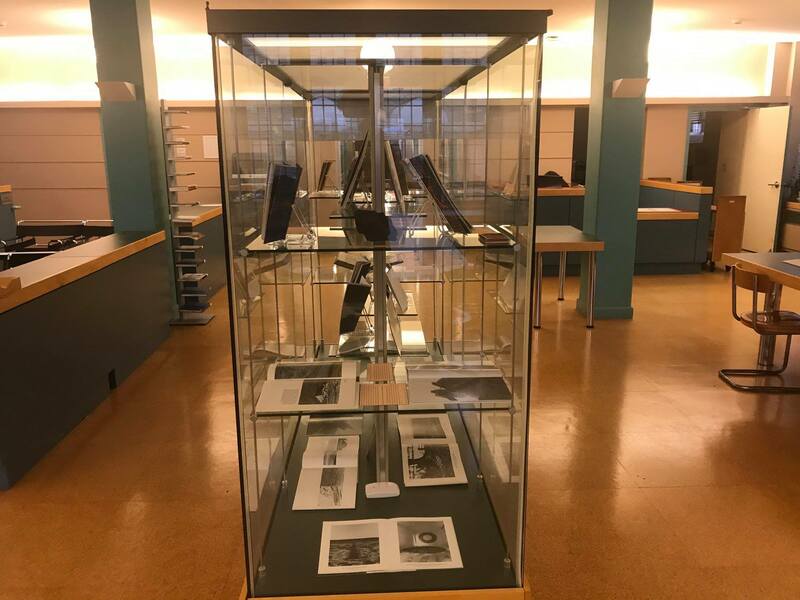 An Exhibition in the Vassar College Art Library March 12-May 29, 2018. 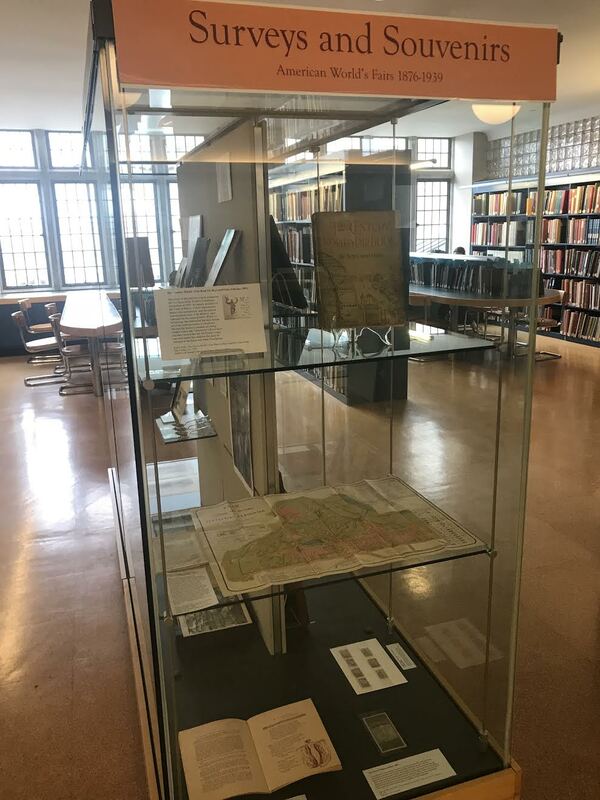 This exhibition was curated by Emily S. Warner, Adjunct Assistant Professor of Art, with the assistance of students in her Art 385 seminar: “Visual and Material Culture of U.S. World’s Fairs,” Vassar College, Fall 2017. 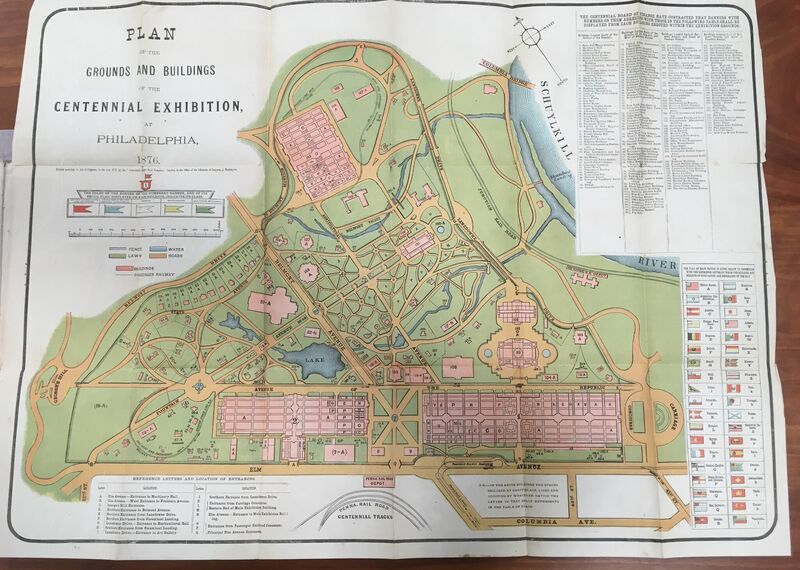 “Sell the cookstove if necessary,” novelist Hamlin Garland wrote to his parents in 1893; “You must see the fair.” Garland’s comment captures the excitement and urgency that drew 27 million visitors to the World’s Columbian Exhibition in Chicago, one of several world’s fairs that dominated American cultural life around the turn of the century. 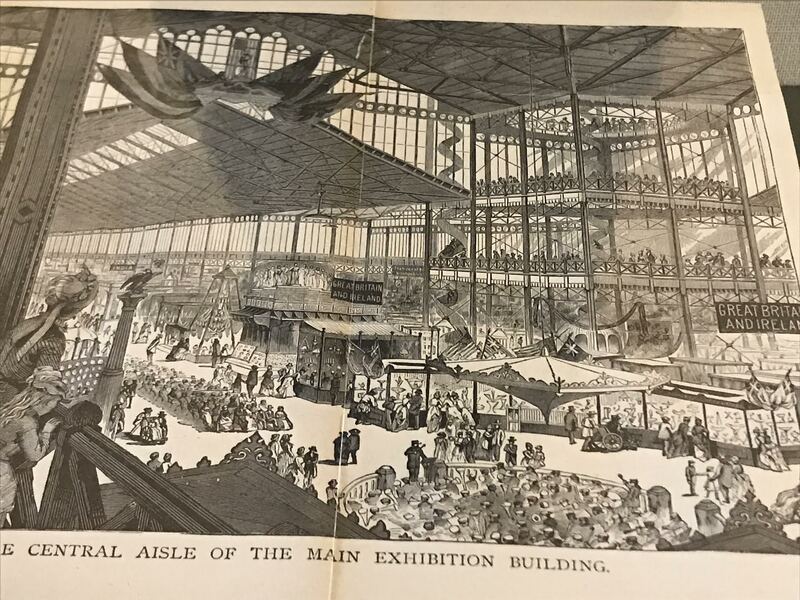 From 1876 to 1039, over 15 world’s fairs opened in American cities, showcasing the nation’s industry and art, and introducing Americans to a world of foreign goods and accomplishments. 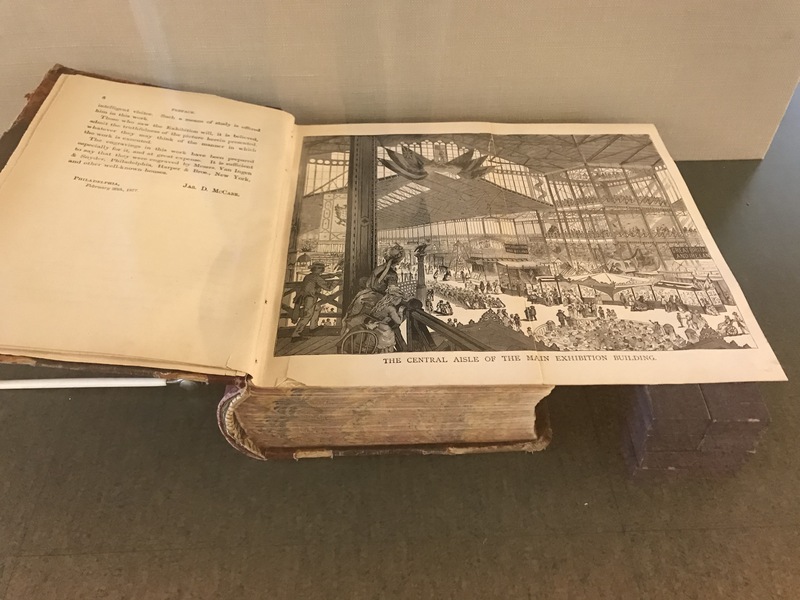 Drawn chiefly from materials in the Archives and Special Collections Library at Vassar College, this exhibition presents the rich material culture of American world’s fairs, from surveys and guidebooks to photographs, children’s literature, poster stamps, and souvenirs. 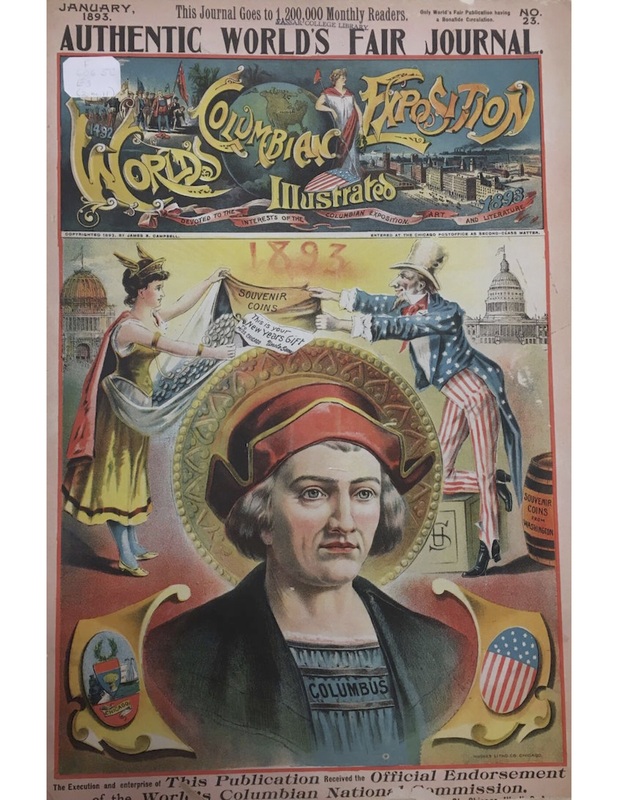 Many of these objects tell official stories from the fairs, promoting messages of American progress, imperial expansion, or scientific advancement. 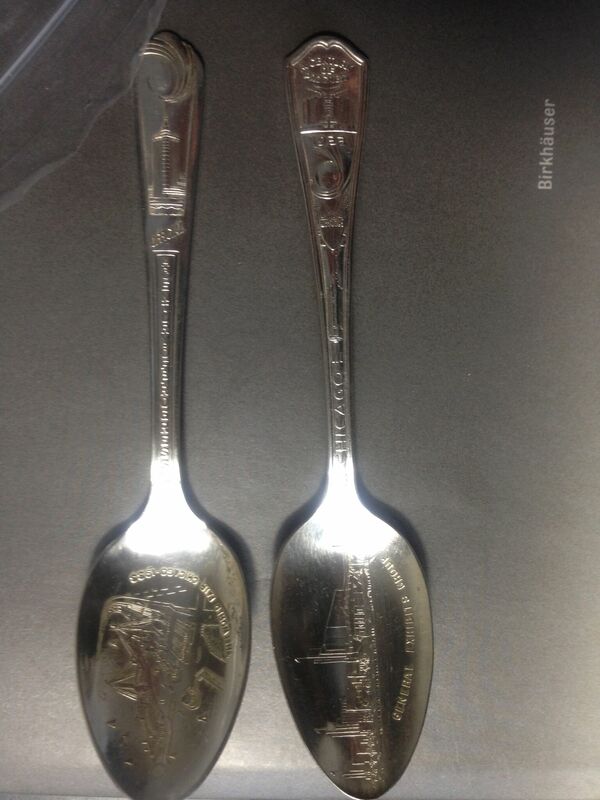 They also tell more personal stories, as material objects that were used, gifted, inscribed, and collected. 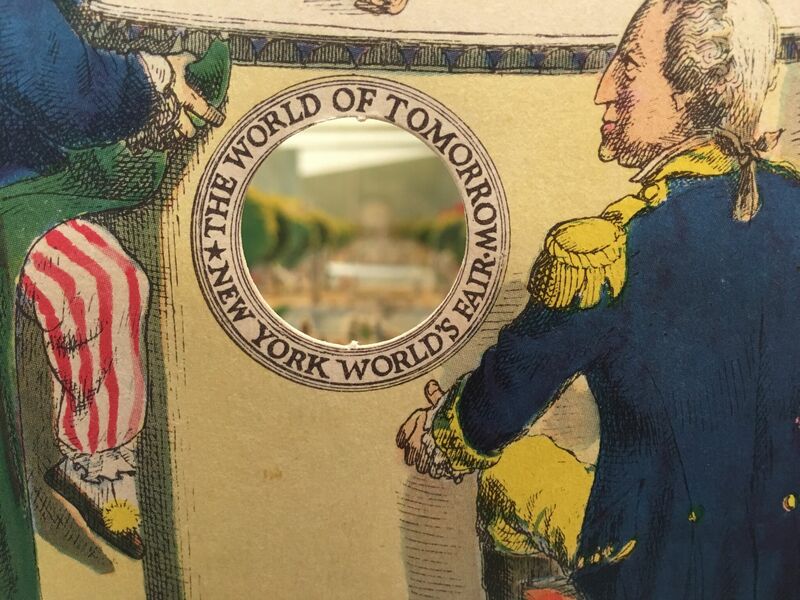 Together, they paint a vivid picture of American world’s fairs during a time of intense national growth and consolidation, as the country celebrated its centennial, closed its Western frontier, and arrived at the eve of World War II. 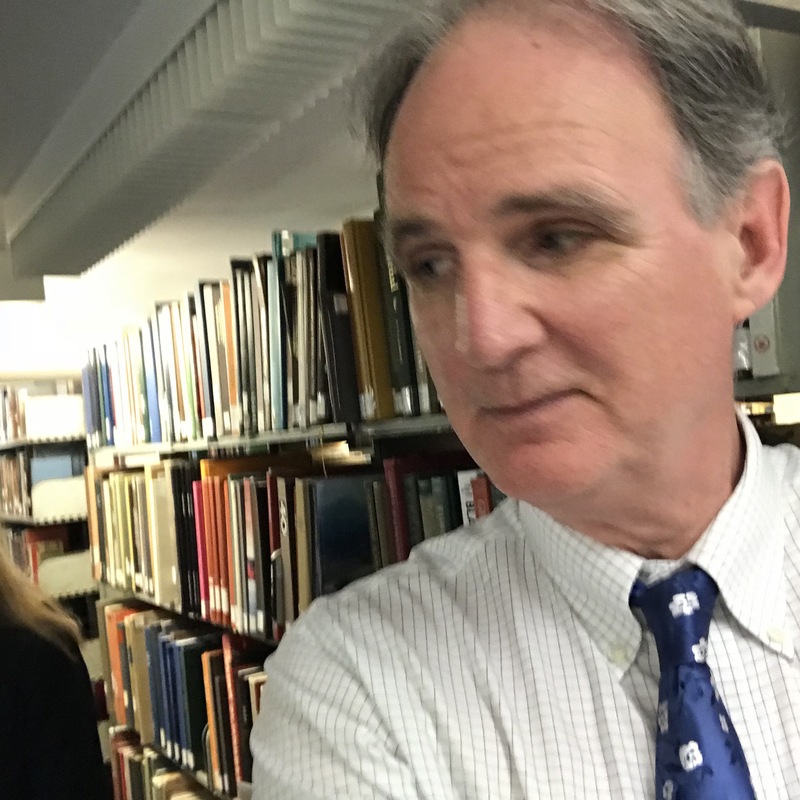 Please note: A recording of a radio interview about the exhibit conducted by Thomas Hill with curator and art historian Emily S. Warner, along with links to documentary videos about these Fairs on Youtube, can be accessed at this link. longer West End Railway provided transportation inside the fair. Building is also visible as the largest structure on the color map at right. 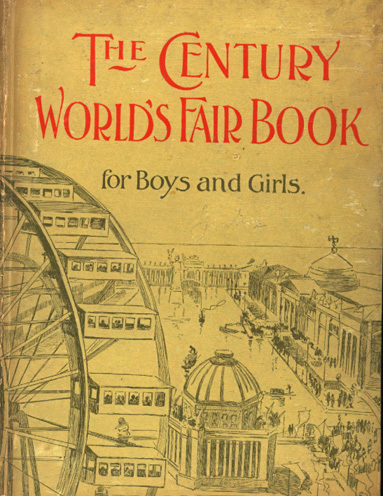 readers follow the “adventures” of two boys and their tutor at the fair. 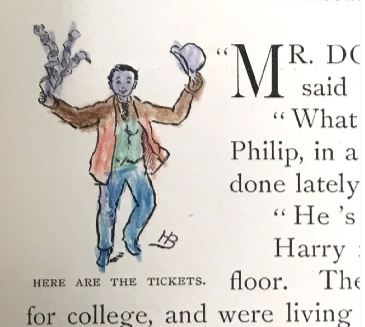 In Vassar’s copy, one such reader has added to the story by coloring in the black and white illustrations. power from the falls to the Electricity Building on the fairgrounds. 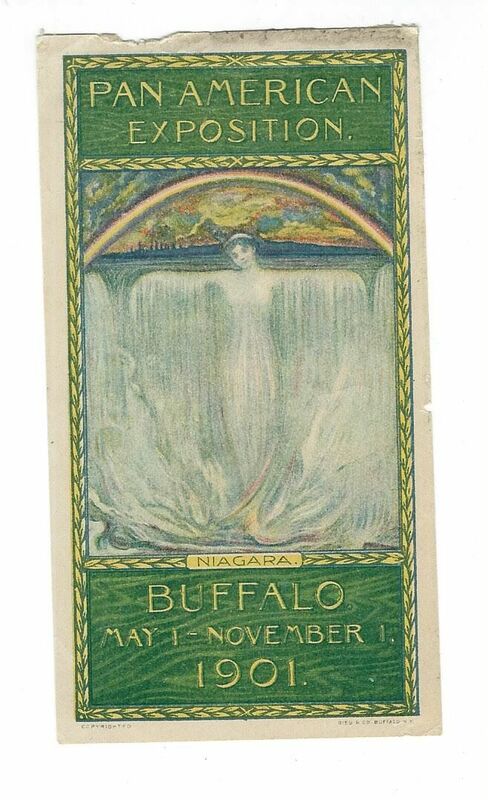 This illustrated book sets the 1901 Pan-American Exposition in Buffalo to music. 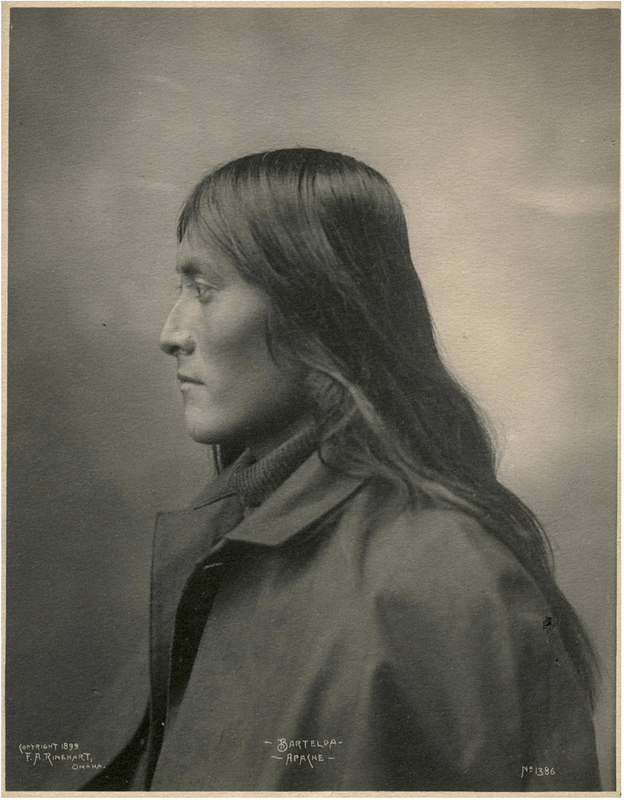 the infamous living exhibits of foreigners and Native Americans. image somewhere between individual portrait and ethnographic type. Frank A. Rinehart (American, 1861-1928). Bartelda, Apache, No. 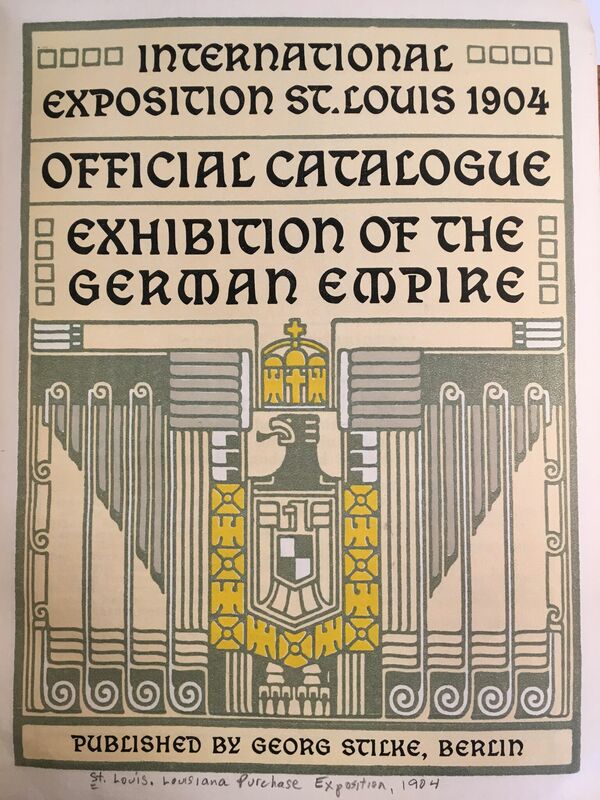 1386, 1899.
with its promise of a kaleidoscope of cultural difference. 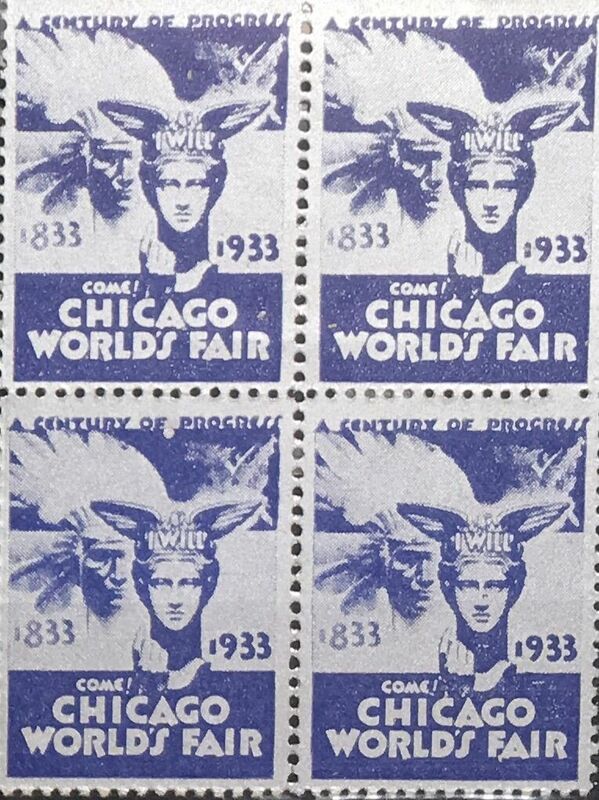 for example, the Alphone Mucha stamps below). ore), and the Pacific Northwest (right, holding a train). 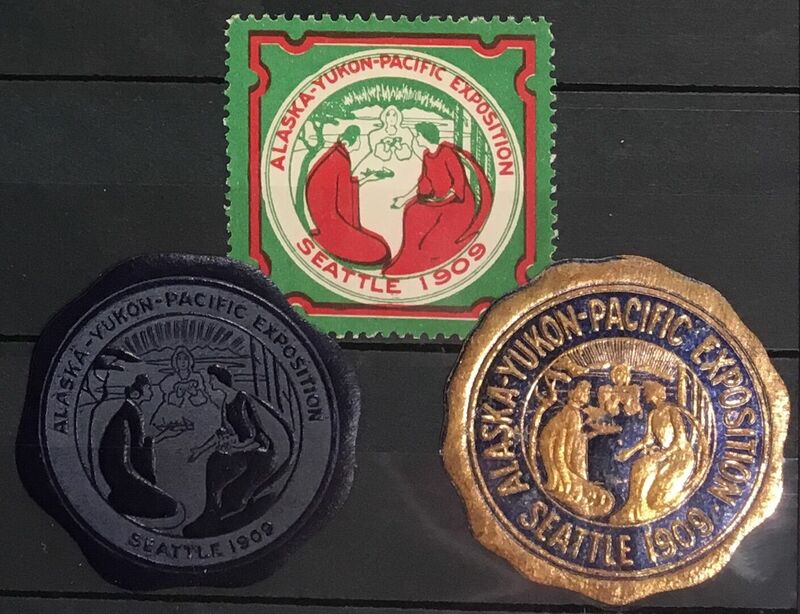 Louisiana Purchase Exposition poster stamps. Alphonse Mucha, designer. 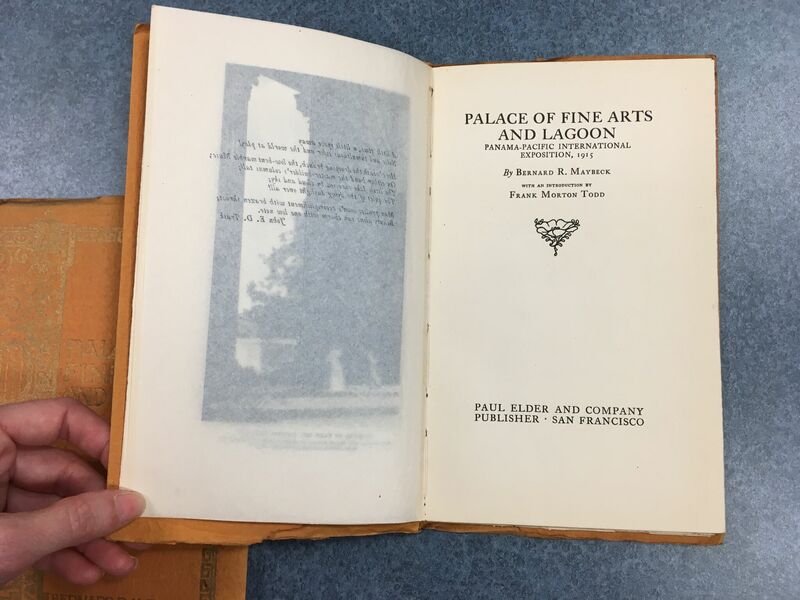 Paul Elder and Company published a suite of books documenting the art, architecture, sculpture, and landscape design at the Panama-Pacific International Exposition in San Francisco. 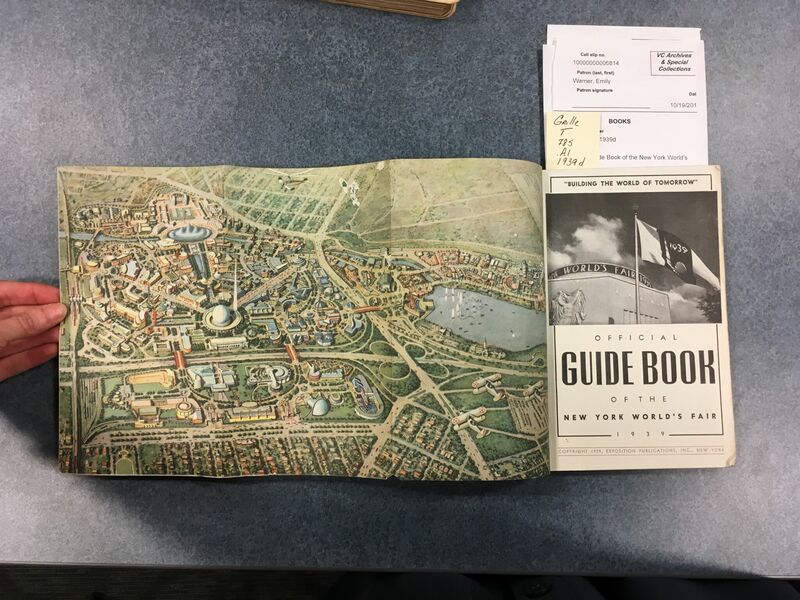 The books’ ornament, curving typeface, and gold lettering echo the color and romance of the fair itself, which was dubbed “Jewel City” for its use of outdoor color and lighting effects. 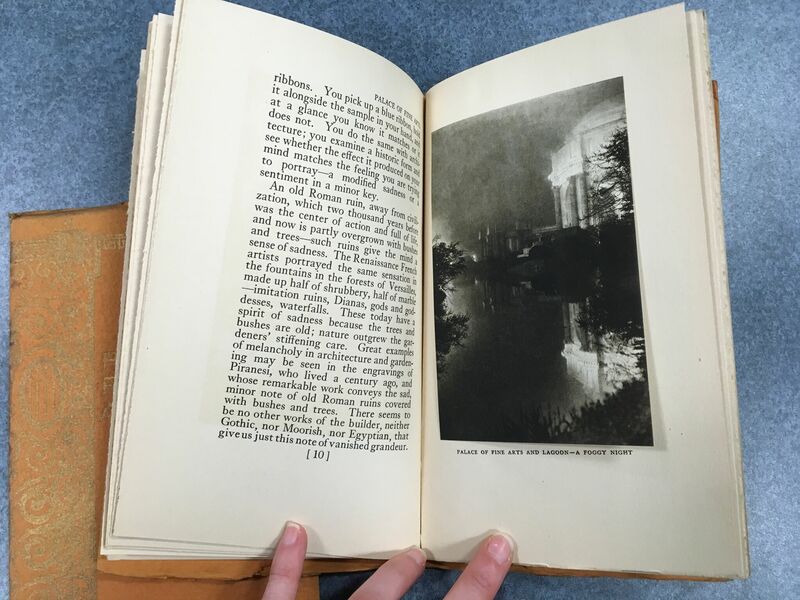 Helen Wright, who owned many of the Vassar copies, obtained the signatures of architect and landscape designer L. C. Mullgardt, painter Eugen Neuhaus, architect Bernard Maybeck, and sculptor A. Stirling Calder, all of whom oversaw designs or contributed work at the fair. 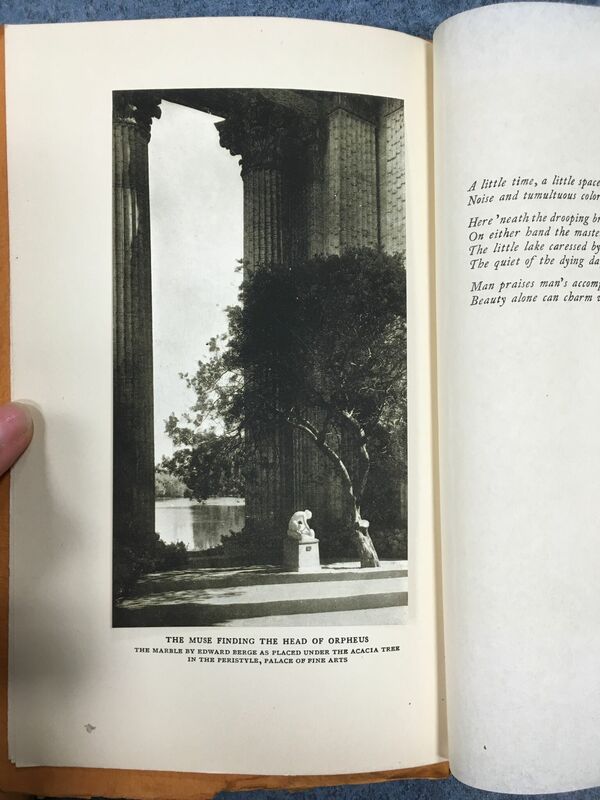 Maybeck’s Palace of Fine Arts, visible in the photograph, offered a melancholy retreat in which to view art, complete with a lagoon site and decorative funereal urns along the base of the rotunda. International Style architecture to the prominence of the corporate pavilion. the Native American figure in the name of so-called progress. 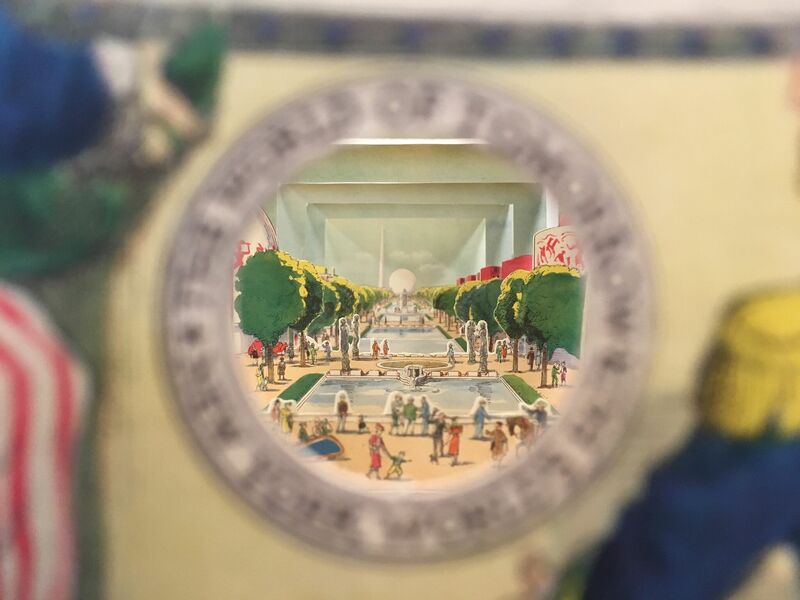 the future to see the fair’s main axis with the Trylon and Perisphere in the distance. 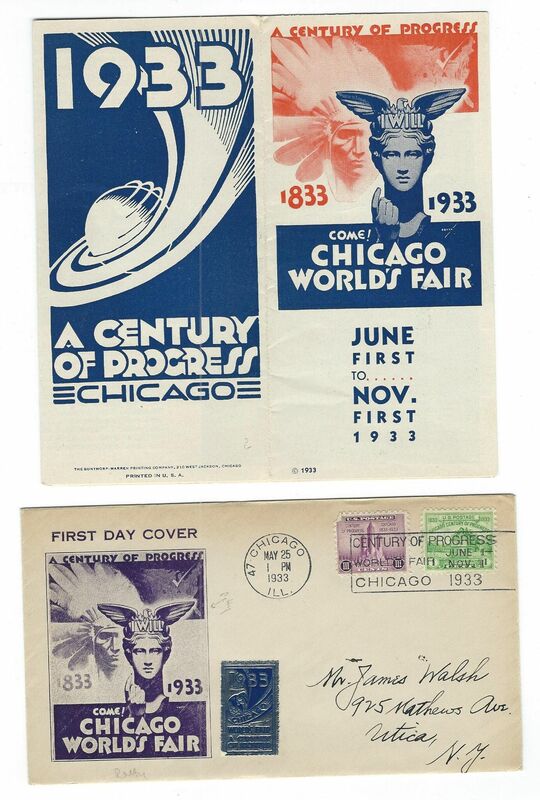 graphic design; note the simplified version of the fair’s Trylon and Perisphere. architecture at Vassar from 1931-37, wrote the introduction.